What does it work with: iPhone 5, 5s, 5c, 6, 6s, 6plus, 7, 7plus and newer versions of these IOS devices as they are introduced. Android app is free in Google play store android 5.0 or newer. Galaxy s4, s5, s6, s7 and similar android devices. How does it connect: It connects directly with your IOS device using Bluetooth low energy. The watch wakes up, collects the data from the smartphone and then turns off, saving valuable watch battery. 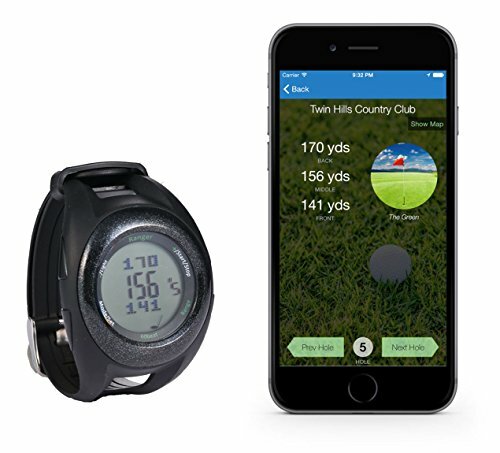 Apps: It works with the 60 beat golf watch app available in the apple app store and google play. The app is free and includes over 34,000 golf courses worldwide. Virtually all USA courses are included. Some of the features: The watch has standard sports watch features. Time of day, two alarms and a stopwatch. The range mode is easy to activate. Just press the range button in any mode and the watch provides the distance to the front, middle and back of the green. Easy setup: Download the app, select your course, pair with the watch and you are in business . What's in the box: 60beat range watch, the battery and an instruction manual. No recharging required: No need to recharge, wear it all day or leave it in your golf bag. If you have any questions about this product by 60beat, contact us by completing and submitting the form below. If you are looking for a specif part number, please include it with your message.